I have been a weight management practitioner for 20 years now and as you would imagine, I frequently come across people that want to lose weight but are uncertain as to which activity would suit them best. More often than not they don’t seem too keen on the idea of running. Furthermore most people (me included at one time) would suggest to these people that running would be a bad idea and that perhaps walking or some gentle swimming might be a better bet. That is until I met people like Phil, who was a smoker, heavy drinker and clinically obese. There would have been many health professionals (me included) that would have tried to dissuade Phil from running and used our professional prowess and clinical judgement to justify our advice. Phil was a definite case of giving the health professional the run around. We were worrying about his obesity, his CVD risk factors such as smoking and blood pressure, but Phil was focussing on the goal and his route out of his destructive lifestyle. He knew what was right for him and as in all such cases, people know what is best for them. He knew he had to run. This really interested me and I have since had the pleasure of meeting many people like Phil that were very overweight or clinically obese and didn’t think they were capable of doing any exercise. I subsequently set about building up a movement that would appeal to these people, in particular those that believed that their days of vigorous physical activity, running and sport in general were long behind them. I spoke to football, rugby, running and martial arts clubs to see if they could help and before long FitFans was born. FitFans aims to help people like Phil to make a start at doing something active that they thought they would never do again. Once again if you are looking for some motivation to start running or getting fit, you could do a lot worse than taking a look at the FitFans project . So let’s do a quick SWOT of running as an exercise for obese people, is it really a mainstream starter or does it just suit the hard cases and nutters that want to do it the tough way? Not too time consuming - in the early phases! It will be up to each individual to undertake their own SWOT and determine if indeed running is for them. All I can say at this point is that I have seen sufficient numbers of overweight and obese people take up running recently and providing they have gone about it the right way, they have outperformed other more sedentary weight loss clients by a country mile. I’m not sure if it is the running itself, or what it takes to be an obese runner that provides the effect (or maybe a bit of both) but either way the difference is stark. 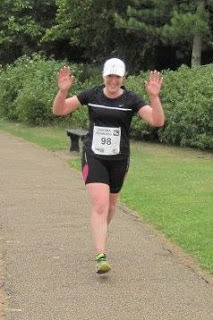 All that I can say is that I have been really stunned by the difference in those that do and those that don’t undertake vigorous physical activities such as running with respect to weight loss, diet and self-belief - which underpins all weight loss. I have come 360° with respect to running as a suitable exercise for weight loss and now I simply ask the client: “Would you like to see yourself running a few miles every day?” They laugh and say: “That will be the day!” When that day does come however, they are utterly transformed. The confidence, belief and motivation that they exude makes them unrecognisable from their former self. I love it when that day comes for my clients. I hope that this article will help people that want to lose weight to consider running as a platform to achieve their weight loss goals. Not all runners are ultra-fit psycho endurance masochists. Most are just ordinary folk, just like you or I. So give running another look. Alan Jackson is the Founder of Discovery Learning and Weight Management Centre which are health and fitness and wellness educational organisations for gym and fitness professionals and personal trainers. Here are three running videos that my good friend Conrad shared with me, to try and get me back into the swing of things with my running, to help me rediscover my motivation and my mojo! Unfortunately I couldn't embed the second or third videos...you need to click these links. They're both well worth watching! Throughout my running career, I've had peaks and troughs in my training and have often struggled with motivation. It’s always been temporary though, and with the support of other running friends have always made it back into my trainers and out of the door, before too long has passed, or too much damage to my fitness has been done. I think I'm in pretty dangerous territory and I have to rediscover my commitment to running, and fast. 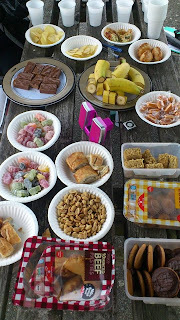 I have to get back into a routine whether I like it or not, I have to stop filling my face with crisps, cakes and chocolate, and I have to start running regularly again because otherwise I can see my weight gain spiral out of control and my fitness levels plummet and my status as a runner, disappear. I had a real wake up call this morning – I walked up the escalator at Oxford Circus tube station on my way to work, stairs I've run up before, and I really felt the effort in my legs. What?! 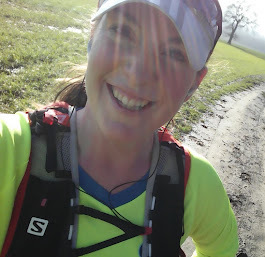 Last year I was an ultra runner who could (relatively) comfortably run 50-odd miles, this spring, I was an ultra runner who just about managed 262 miles in 10 days, next year I'm meant to be tackling 100 miles in a day! But I can’t walk up a flight of stairs! WFT?! Next week, it's the Berlin Marathon, and although I have a number, I've decided to forfeit my place because I'm just not fit enough for it. I'm going to miss Johnny's 100th, and running with a whole crew of friends who are going to be out there - Kaz, Heather, Mel, Craig, Keith, Rosemary and John. I'm gutted not to be there. Every person mentioned above has played such a massive part in my running achievements so far, and there are lots of others too who have made a difference with their support and advice over the years. What an incredible group of people they are - I feel absolutely privileged to know them all. I think I owe it to everyone to stop being so lazy, stop making excuses and just get back to training. There's not a single reason to stop running, and a thousand reasons to keep at it, especially now that I feel really depressed thinking about what everyone else was up to while I was sat on the sofa this weekend! I want to get back to being able to really enjoy being involved and to feel like a legitimate part of the awesome running community again and to take part in some of these fantastic events...and not keep pulling out of them! So now I've given myself a good talking to through this this post, I've got to get out there and actually do the running. Taking any more time off just can’t be an option any more…I really don’t want to have to change the name of my blog and I definitely need to add some more medals to my collection! So...the Grand Canyon. One of the Seven Wonders of the World and on 29th August, I was lucky enough to go for a run there! 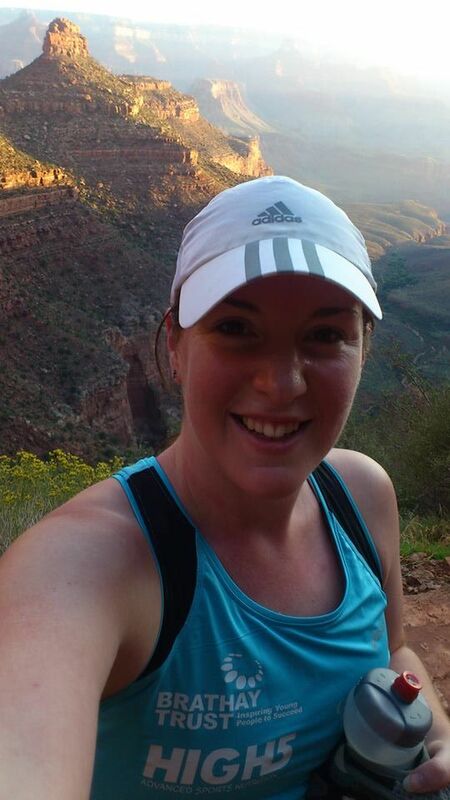 I had been excited about this part of our holiday for weeks before we went - I may have lost most of my fitness, but running in the Grand Canyon was something I definitely wanted to do regardless, a real once in a lifetime opportunity....and it was EPIC! 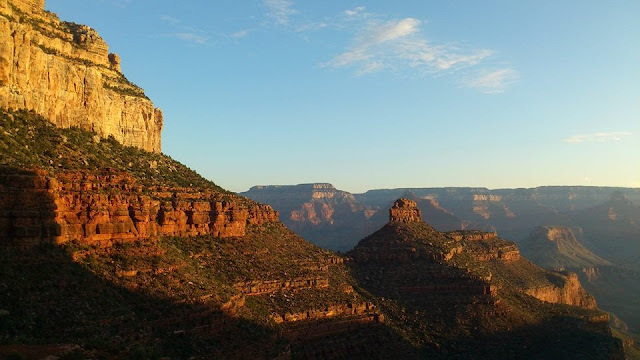 We drove from Las Vegas, where we'd spent the first few days of our holiday, and arrived at the South rim of the Grand Canyon in the dark, and checked into the Kachina Lodge where we were staying for the night. 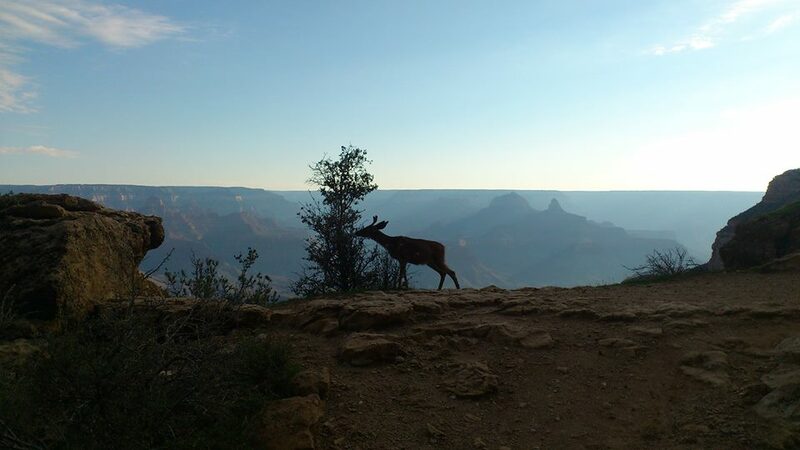 There were some enormous, antlered wild elk wandering around in the grounds of the hotel which was a bit disconcerting, and the sky was incredible - pitch black and more stars than I think I've probably ever seen above me...but as for the Canyon, it was invisible and so we were both really looking forward to the dawn. We set the alarm early, and so were up before it was really light. We opened the curtains and were amazed at the view...we really were staying right on the edge - it was absolutely incredible! I wanted to get my run finished before it got too hot...I wasn't planning anything long but knew in the heat of the day it would still be almost impossible! We'd read the information that had been left in our room about the various hiking routes into and around the Canyon, and they all stressed just how difficult it was going into (and more particularly, getting out of, the Canyon), and that hikers should be realistic about their fitness levels, aware of the affect of the altitude (7000ft) and be prepared for a very challenging walk....so I carefully decided upon what seemed to be the most achievable, safest route for my run - The Bright Angel Trail. Anyway, I got ready quickly and headed out, closely followed by Francis who was planning to take some photos in the early morning light. 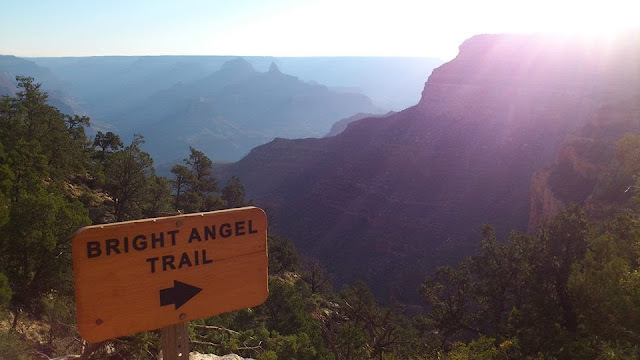 The start of the Bright Angel Trail was closer to our hotel that I had hoped, but I did at least get a few minutes running along the flat before I started my descent! When I got onto the trail, I think I was smiling with every step. The path was steep enough to be easy but still very controlled as I ran down, rough and technical enough to feel like I was really trail running, but maintained enough to be relatively safe as long as I paid enough attention, and the views were just unlike anything I have ever experienced. The temperature at dawn was perfect too. I passed a few other walkers but not too many, and felt relatively alone, and at one with the view...except for the odd chipmunk I disturbed. I took loads of photos with my phone. Unfortunately not many of them came out, but it was wonderful, and if I hadn't kept reminding myself that I would have to run back up this trail, I could have easily carried on down to the river! It was absolutely incredible and a couple of miles that I'll never forget! I was sensible though, and very soon decided that I had to turn around to face the hard work of running back up the way I'd come - it's an average of a 10% gradient, and so, by the very law of averages, some of it is definitely steeper! It was starting to get a bit warmer too, and sections of the switchbacks were bathed in light as the sun started to rise, so it was decidedly more of a challenge than it had been coming down! The numbers of people walking down the trail were increasing too, with their full trekking outfits and poles - most were absolutely astonished to see a runner in just shorts and vest, and a handheld water bottle! They gave me lots of encouragement though, and all seemed very impressed...except for the two cowboys who passed me on their horses - they didn't seem very impressed, and ignored me as I squeezed myself again the rock so they could safely pass me by. I got the impression they'd rather they didn't have to share the trails with anyone! Eventually, it became clear that the elk weren't paying us any attention, and if we didn't do something we'd be stood there all day, so I started gradually edging my way towards them. After initially seeming a little startled, the elk went back to their food, and as I came closer, unhurriedly wandered off the narrow path allowing us all to carry on our way. I saw this posted on my friend Conrad's facebook page today, after he had to pull out of the SVP100 race. It's a passage referred to as "The Man in the Arena" from the "Citizen in a Republic" speech by Theodore Roosevelt in 1910 (according to Wiki). It’s been quite a while since my last blog post, but having been told by a new follower on twitter that they've been reading my blog (woohoo!) I felt I should post an update about what I've been up to, this last month. On Friday 16th August, for no apparent reason, I decided that the next day would be a good day to run a marathon, and so managed to wheedle a place out of Foxy for the Enigma Gold marathon which was being run on Saturday 17th August. I knew I wasn’t prepared but wanted to give it a go, get a gauge of my fitness, and to see my Enigma friends J It’s no surprise that it wasn’t the most intelligent decision I've ever made and it didn't go too well. The marathon was very, very hard work, and my dodgy ankle was troublesome towards the end of the race - I found myself walking much more than I ever usually would to try and minimise the damage I felt I was doing and realised that the longest run I should have attempted on it was probably about 20 miles. So, it wasn’t pretty, and I finished in 04:54, which it’s fair to say I was very disappointed with. I shouldn't have been surprised, given the lack of training I've done since the 10in10, and the ankle, but still, I didn't realise I’d got quite that unfit. I got an awesome medal though, and that went some way to cheering me up!! A smile because I'm finishing! Things started looking up though, as on Saturday 24th August, Francis and I jetted off on holiday for a 2.5 week roadtrip in the US. We flew into Las Vegas for a friend’s wedding, then drove Route 66, went to the Grand Canyon (where I ran - an experience which is going to have a blog post of it’s own), drove down to Palm Springs, and Los Angeles, and then drove up Highway 1 to San Francisco. It was an incredible holiday and we had a absolutely fantastic time. 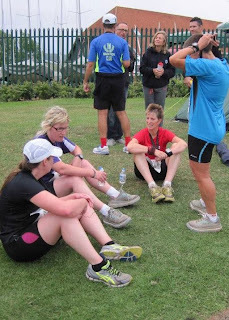 We got back on Thursday morning, 12th September, and although the jet-lag has been crippling, on Saturday, I found myself crewing at the Stour Valley Path 100km inaugural race…an event I had been due to run but obviously had to pull out of due to my chronic lack of fitness and the infamous ankle. 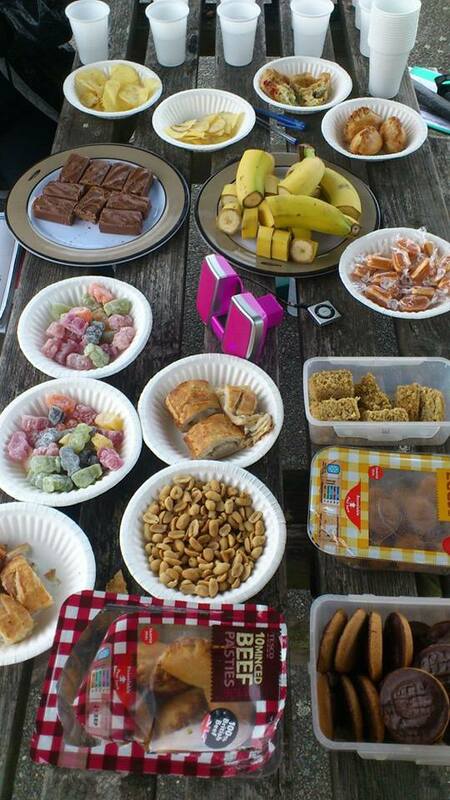 Food at our check point! 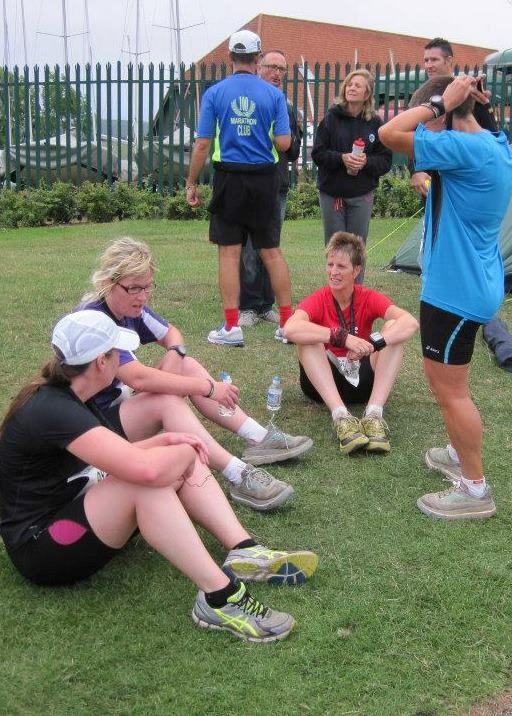 So…here we are, six weeks before my next scheduled race, the Stort 30…the race where I finished as 1st lady in 2012. I’m certainly not going to be anywhere near that end of the field this year, but I would really like to at least be able to take part! Now the jet-lag has pretty much gone, I am planning to try a run this evening, and then get back to normal and start following my training plan, as my fitness has definitely hit a real low and I really can't spend any more time not exercising. None of my clothes fit me anymore!! I’ll take it very slowly, will try and be sensible and hopefully my ankle has had enough rest to let me start upping my mileage – I’ll do it gradually, and just hope that I can get myself ready to run 30 miles on 27th October.